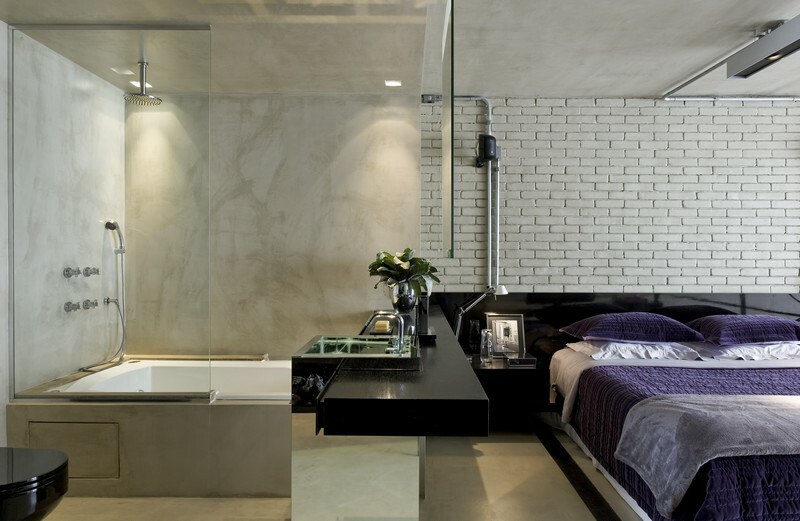 The loft of a hundred square meters, located in the southern of Sao Paulo, was designed with some of its owner characteristics. As he lives alone, the integration of areas has become one of the major parties adopted. As a result the project achieved the ideal match between comfort and modernity, giving, at the same time, an industrial look to the building. 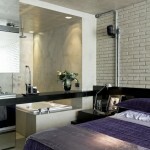 Besides, colors as black and grey have emphasized the masculinity of the space. Integration appears as the the key word to the success of the project, firming much more the fundamental idea of a Loft. The choice for just one kind of covering for the walls and the roof of the whole apartment provided more uniformity to the area, creating a single box. With the goal of reaching the balance between rustic and industrial characteristics and warm and comfortable sensation, burned cement was chosen as the main covering. A special resin was used in the effort to get more impermeability of the wet surfaces. On the lower floor, the living room, dining room and kitchen have also been unified, once they don’t have sheds or division, the dining table appears as a wooden board made of Pine setted in a kitchen workbench adding modernity to the materials. In the mezzanine, the elimination of any division between rooms bathrooms and the closet, was the solution chosen to provide wideness to the area. The low headboard designed by the office, with the two hanging bedside tables on both sides, accentuate the horizontality and helps providing much more amplitude. The composition of soft elements as the hanging board made of ebonized Sucupira in the bathroom that takes place of a normal gabinet, and the mirror setted on the roof with faces to both sides, contributed to reach the target. The contemporaneity present in this project goes beyond of his structure, being also strongly presented in the ornamental elements. Each detail was specially thought to accentuate the characteristics of this kind of apartment remitting them to the sheds of New York.